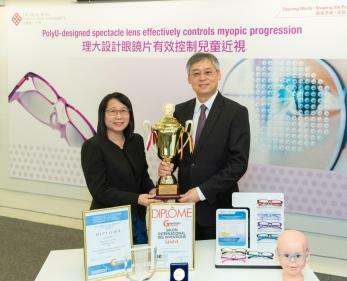 A specially designed spectacle lens developed by The Hong Kong Polytechnic University (PolyU) was found to have slowed down myopia progress by 60% in participating children, and 21.5% of them had their myopic progression halted completely. This lens will be launched in summer this year, offering a non-contact, spectacle lens solution to myopic children. The Defocus Incorporated Multiple Segments (DIMS) Spectacle Lens designed by Professor Carly Lam, Professor of the School of Optometry at PolyU, and Professor To Chi-ho, Henry G. Leong Professor in Elderly Vision Health and Head of the School, is designed for slowing myopic progression in children. It has won the Grand Prize, Grand Award and Gold Medal with the Congratulations of Jury at the 46th International Exhibition of Inventions of Geneva, 2018. DIMS Spectacle Lens comprises of a central optical zone for correcting refractive error (i.e. myopia and astigmatism) and multi-segments of constant myopic defocus surrounding the central zone extending to mid-periphery of the lens. It provides clear vision and myopic defocus for vision correction simultaneously for the wearer at all viewing distances. In doing so, the lens makes use of the natural homeostatic mechanism known as 'emmetropization', whereby the eyeball adapts and shapes to receive focused images as it does for normal vision. "We have tried to incorporate myopic defocus optics into different treatment modalities, such as contact lens. For spectacle lens, the challenge is the eye will move behind the spectacle lens and therefore the myopic defocus optics has to be incorporated all over the lens," said Professor To. "With the DIMS Spectacle Lens, we are able to put in many micro-lenses all over the surface of the ophthalmic lens. When the eye moves around different regions of the spectacle lens, the eye still experiences a constant amount of myopic defocus," he added. A total of 160 Chinese children aged 8 to 13, with myopia from 1 to 5 diopters (D), and astigmatism and anisometropia of 1.5D or less completed a randomised double-blinded clinical trial from August 2014 to July 2017. In other words, children wearing the DIMS Spectacle Lenses had significantly less myopic progression by 59%, and axial elongation by 60%, as compared with those wearing the single vision lenses. The children in the treatment group also indicated that the DIMS Spectacle Lens could provide comfortable, good vision at short and long distances, and good perception of depth same as single vision spectacle lens. "High myopia can cause retinal complications. The serious case could be a retinal detachment that may result in permanent blindness or visual impairment. The DIMS Spectacle Lens helps safeguard the vision of children," said Professor Lam. The DIMS Spectacle Lens is licensed to a lens company experienced in eyeglass lenses and will be available in the market in this summer.